Last weekend, we decided to fish an unexplored coastline on the other side of the island. We had to hike for about 10 minutes to reach the water from the road, but were rewarded with a perfect view of bright blue water, a turtle grass flat and almost zero wind. We had been walking towards the flats, east along the beach for about a hundred yards when we spotted a large fin cruising down the shoreline towards us from about 30 yards away. It was a shark, a big one. I realized that I had an 8 inch Deceiver pattern tied onto 10 inches of wire and, acting on pure reflex, I waded into knee deep water as the shark slowly cruised directly towards me. My first cast led the shark by 3 ft and was right on the money. She shied away and made an 180* turn. I waded ashore and jogged down the beach to get ahead of her. It was then that I got my first good look. She was about 6ft long, a Lemon Shark, cruising in a foot of water, with her dorsal and tail fins, as well as a good portion of her back, sticking out of the water. She was 10 ft from shore. Two attendant remoras were dutifully staying attached to her body as she moved through the shallows. As I got ahead of her and waded in, I was able to look back West from the direction we had been walking, and spotted a small boat with three locals in it, motoring in our direction. They had obviously seen the shark. I had one more good cast, keeping the fly right in the sharks face, waiting for it to chew on it, but she passed it over. The boat was approaching quickly and they were headed straight for the shark. One man was leaning over the bow with a length of rope looped over as a lasso. They intended to rope the shark's tail. Another man in the back of the boat readied a club. Sharks are used for lobster bait down here. I was ashore with my two friends and we were hoping against hope that the shark spooked and got out of there before it was captured. We contemplated throwing some rocks or quickly wading towards it to scare it. When the boat got within 5ft of her exposed tail, the water erupted and she powered out of sight. I thought about my actions and how I had reflexively cast to a huge fish without considering the consequences. First off, a 100lbs fish on 10wt would have taken me hours to reel in. The best I could have hoped to do would be to semi-beach the exhausted animal and cut the leader. Forget about safely reviving it. An all around bad choice. As I stood and watched in horror as three locals attempted to rope and beat to death a perfect animal, I realized that fish like that, large breeders who represent the future of the fishery, should just be left alone. They're rare worldwide, and face a terrible future due to finning and long lining. Hooking and fighting one would have been irresponsible and dangerous. I count myself lucky to have even seen it. I was relieved that I didn't witness it's death. Turtle season has just opened up here, so there is enough to be pissed off about. Thats right. Turtle Season. As of May 1st and until November, every local is allowed to kill one turtle of any species. 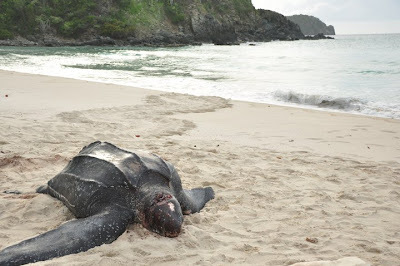 This Leatherback was found killed earlier this week. It crawled ashore, laid eggs, was killed by an ax or machete, and the eggs were dug up and taken. Presumably, someone killed the turtle and was then unable to move it because of how heavy it was. Nightly, people patrol the beaches here with machetes, buckets and flashlights to kill turtles and harvest eggs to eat. Green, Hawksbill, Loggerhead and Leatherback Turtles are in these waters. One mile away in the US Virgin Islands, this act would be punishable by years in prison. Here, in the BVI, there is actually a season for harvesting endangered species. Happier times. Tonight this Leatherback laid her eggs and made it back to the water. However, nests are not ID'ed and roped off, so they are unprotected from people with buckets or accidental exposure by people who just don't know they're laying their beach blanket on the nest of a sea turtle. Back to fishing. We waded out onto the flats and spotted a pod of about a dozen small Caribbean Reef Sharks. They were circling a small sandy patch and we took up positions around the edges of the sandy zone. Over the next hour, we had about 50 shots at the small sharks. You've got to lead them just right, and keep the fly right in their faces. Eventually, they'll chew on it. These small sharks can be landed in a few minutes. They are lively throughout, jumping and rolling and running into your backing, and are quickly revived and released. This little guy liked the big Deceiver. We hooked four and landed two. The fly of the day was a black and red woolly bugger on size 8. It was a great day. It was also the day I caught my very fist shark. I do believe that the Turtle season should be abolished, it is very cruel to murder such beautiful and endangered creatures. It was a great day. I do believe that the Turtle season should be abolished, it is very cruel to murder such beautiful and endangered creatures.